Originally published in the Toronto Star on May 15, 2007.Â Â Thousands of experiments are taking place right now. Experiments with people. Experiments with animals.Â As your eyes scan these words, thousands of others are scanning the universe, craning for a glimpse of its birth. Still more peer through microscopes of all shapes and sizes, from optical to electron. Some of these experiments are old, some are new. Two would almost certainly be disallowed under modern ethical standards. All of them will make you think. The larger the object, the stronger the gravity. Or so goes the theory, which was formulated in 1916. The problem is, no one has ever observed a gravitational wave â€“ not directly, anyway. Earth is simply too far away from the fireworks (our Milky Way is a quiet little place, not easily disposed to the massive, violent collisions that give rise to gravitational waves). Physicists and astronomers would give their eye teeth to detect one, the most stringent test ever of Einstein’s theory. 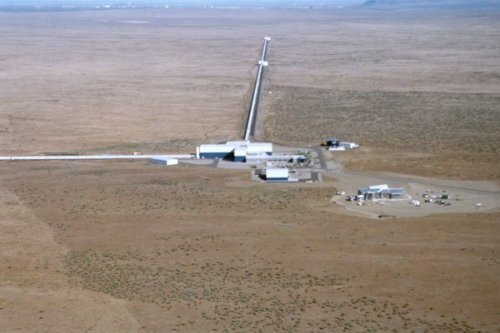 Enter LIGO (Laser Interferometer Gravitational Wave Observatory), the gravitational wave lab that is the most expensive and ambitious project of the U.S. National Science Foundation. The foundation, which spent $365 million (U.S.) on the observatory, funds about 20 per cent of American research. LIGO’s mandate is to find those gravitational waves. To this end, it operates two enormous observatories in unison, one in Louisiana and one in Washington (the duplication enables scientists to filter out local disturbances such as earthquake tremors). Each consists of two tubes joined in an L shape that stretches 4 km in both directions. Inside each tube is an “interferometer” consisting of (among other things) a laser beam, a splitter and a series of mirrors, all in an ultra-high vacuum. Under normal circumstances, the reflected laser beams should effectively cancel each other out. However, (the theory goes) when a gravitational wave passes through the system, space-time in the local area is slightly altered. If the properties of the wave are just right, the path length for one or both of the reflected beams changes and the waves fail to cancel. They’ve been waiting for a glimmer since 2002. Space, the final frontier. These are the voyages of SETI, the Search for Extra-Terrestrial Intelligence, which has been around in one incarnation or another since the 1960s. Its continuing mission: to find aliens. As an exercise in science, SETI is a curious beast. Most experiments have a clear termination point. If A doesn’t work, try B. SETI is potentially infinite â€“ E.T. might not be home. He might be too primitive to hear us. Or he might be ignoring us. Also, SETI experiments make several crucial assumptions that essentially boil down to good guesses: that aliens are carbon-based, subsist on water and are receptive to radio frequencies. Another peculiarity: there is no central “SETI Centre;” SETI is a collection of institutes scattered over 30 countries. It’s not a hierarchy, it’s a goal: to detect transmissions from an alien civilization. Some outposts are more elaborate than others, and one of the largest of these, SERENDIP, is at the University of California, Berkeley. One of the most interesting aspects of SERENDIP is SETI@home, a co-ordinated effort to analyze mountains of data collected from SERENDIP. Anybody with an Internet-active computer can participate in SETI@home by running a free program that downloads and analyzes radio telescope data. Since 1999, the project has logged an estimated 2 million years of computing time. In 1971, Palo Alto police department (near San Francisco, Ca.) charged 12 men with armed robbery. The men were arrested, strip searched, sprayed for lice, manacled and then incarcerated at a mock jail in the Stanford University psychology department. None of them were criminals. In fact, they were volunteers. Twenty-four undergraduate students had been recruited for a psychological study, the objective of which was to explore the dynamics of power and captivity. Half acted as “guards” and the other half as “prisoners, their roles decided with a coin toss. “Guards” were authorized to dictate 24-hour-a-day rules, though they were explicitly barred from physical violence. The Stanford Prison experiment is a relic of the permissive ethical standards of the 1970s. Today, it would never be approved, funded or published â€“ in an academic setting, anyway. In the 1960s, a friend of Phillip Zimbardo, Stanley Milgram, set out to explore the psychology of obedience. The subjects were recruited from all walks of life and told that they were participating in a study about the effect of punishment on learning. Subjects were assigned the role of “teacher” and given a list of word drills to impart to a “learner.” The “teacher” and “learner” sat in separate rooms and could hear but not see each other. For every wrong answer, the “teacher” was told to press a button that would zap the “learner” with a powerful electric shock. The more wrong answers, the more violent the electric shock. Here’s what they didn’t know: the “learner” was a paid actor and there were no electric shocks. The “button” was connected to a tape recording of bloodcurdling pre-recorded screams. When the “teachers” heard the screams and cries of the “learners” they were “torturing,” almost all of them became very uneasy. However, most continued to administer the shocks â€“ after they were assured that they would assume no liability for the experiment. Astonishingly enough, 65 per cent of the participants administered the maximum “pain” possible: a 450-volt shock. All of the teachers were volunteers â€“ they could have walked away at any moment. When and why do we defer to others? Why is a white lab coat such an effective means of persuasion? In 1953, Stanley Miller and Harold Urey of the University of Chicago embarked on a search for the origins of life. Early Earth was turbulent and even today it is almost impossible to imagine how that chaotic soup of inorganic molecules ever gave way to life. Miller and Urey set out to re-create it. They sealed water, methane, ammonia and hydrogen into a system of glass tubes, flasks and electrodes. Heat and electricity were used to replicate evaporation, atmospheric cooling and lightning storms. It only took a week for the miracle to occur. Although their assumptions about the exact chemical composition of the Earth’s atmosphere have since been challenged, their result remains fascinating. Simple amino acids, the building blocks for proteins, had somehow blossomed in that chemical chaos. The elements of life had been begotten from the lifeless.